Header image courtesy of SourceFed. Check out their YouTube video below if you want to know why chopping wood is one of the manliest activities you can partake in! Unless you’ve got a high-powered hydraulic splitter, a splitting maul is a much better tool for chopping wood than a regular old axe. We’ve compiled these top 4 choices for you to compare and pick the best splitting maul for your needs. Use the quick comparison chart below, and check out the full reviews further down to help make an informed choice and pick the right one for you! 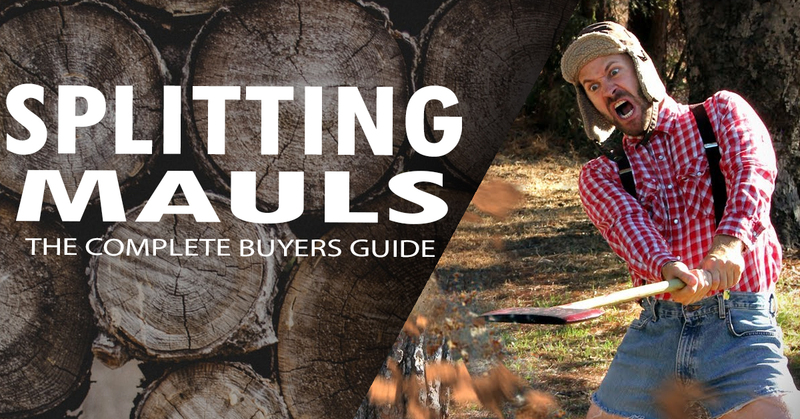 What is a Wood Splitting Maul? 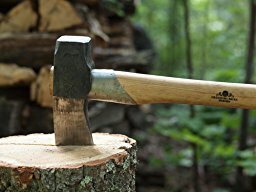 While most people may think that the most often used tool for splitting wood is an axe, they are likely just confusing axes with mauls. A splitting maul is the preferred tool in most cases when splitting wood. While a traditional axe and a splitting maul have many common features, they are two distinct tools with different ideal uses. Again, while both tools are quite similar, their unique design features make them best suited for different tasks. Because of an axe’s design, with its sharp blade and thin head, it is best suited for chopping wood, not splitting wood. In other words, axes should be used to cut down trees and the resulting logs into smaller pieces. 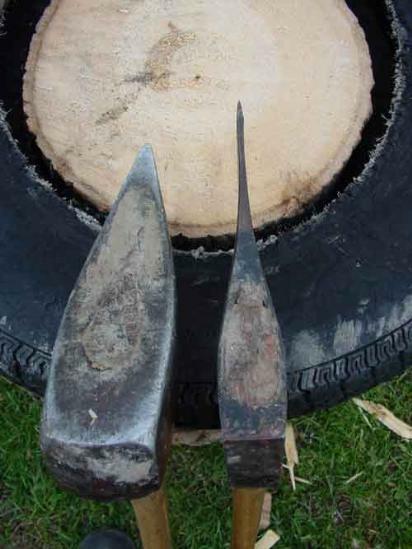 The sharp edge of an axe cut through wood fibers and as the axe travels through the wood, the rest of the thin blade slices through deeper fibers. Once the blade begins to thicken near the broad head, it separates the wood and allows wood chips to escape the incision area. Because the force of your swing when using an axe is focused into a thin, sharp blade, when trying to split wood you will find that the blade will sink deeply into a log but perhaps not effectively split the log. In the same way that trying to split wood with an axe is like swimming upstream, trying to chop (cut) wood with a maul is equally difficult. Because of the thick and blunt edge, trying to cut wood fibers would be extremely arduous. But, we’re not looking to chop with a maul, we want to split! And for that, it’s the perfect tool. Swinging the large heavy head will produce a great force focused into the blunt V-shaped head. The dull blade is still thin enough to find its way in between the wood fibers and with the thick head of the maul – combined with the downwards force of your swing – will push apart the log effectively along the grain, splitting your wood with much greater ease. The best splitting maul will have a large, heavy wedge-shaped head. The splitting axe uses its large weight and momentum to crush wood fibers and split logs along the grain. The timestamped clip below also gives a good example of an axe vs maul, despite his bad English! 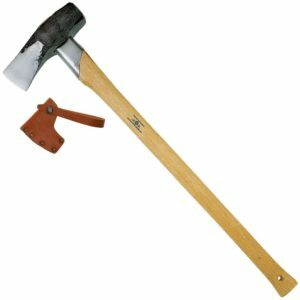 When choosing a wood splitting axe, there are a few things to consider. Will you prefer a handle made of wood or synthetic and metal materials. Synthetic material such as a fiberglass/steel combo handles function to reduce shock and may be more resilient than wood handles. How heavy of a wedge head do you want? Synthetic/metal handles tend to be heavier than wood handles since they are reinforced with steel. A heavier wedge will provide greater force, but it will be more tiring to use. You should also ask yourself how much are you willing to spend. Some chopping axes can seem expensive; however cheaper models will also be manufactured from cheaper materials. You really do get what you pay for and if you plan on using your axe for a while, the investment will be worth it. The Gransfors Bruks Splitting Maul is undoubtedly one of the most capable axes on our list. This Swedish made axe is the clear favourite among most folks. It is well forged and has a beautifully shaped and sharpened head and blade. The blade comes The handle of the Gransfors Bruks is made of hickory, a good and sturdy reliable wood. The 31 inch handle is a perfect length, ergonomic and well-shaped to fit perfectly in your hands. The head weighs 5.5 pounds, which is a little smaller than some of the other mauls on our list, but it is more than capable of chopping large logs with ease. The lighter head allows you to generate more speed during your swing, translating into a greater force on the log. Another great feature of the Gransfors Bruks is the Overstrike Collar. The overstrike collar is the metal collar wrapped around the handle directly below the head. If you strike the log too close to the center, you may bash the handle directly on the log if your swing does not fully split the log. The overstrike collar protects the handle from this abuse, which helps reduce damage to the handle, providing you with a longer lasting product. A wooden handle does require slightly more maintenance than a fiberglass or palstic one, but the look alone in our opinion is worth it. The axe also includes a leather sheath to protect the wedge while storing and prevent dulling or other such damage. Although the Gransfors Bruks can be on the expensive side, you are paying for quality. You can check out what the forum users have to say, and amazon reviews. The Gransfors Bruks is the best splitting maul you can buy – if you’ve got the dough. The Fiskars Splitting Maul is the first non-wood handle model on our list of reviews. 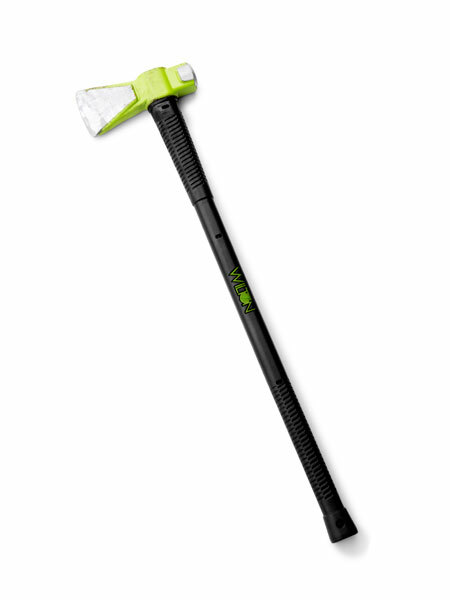 This axe features Fiskars’ patented IsoCore Shock Control System in the handle. The handle is constructed of thick plastic, with a steel-reinforced fiberglass core for extra strength. The inside of the handle is also insulated to reduce shock and force to your hands while splitting. It’s clear that Fiskars put a lot of thought into the design of this tool. The handle is contoured, fitting comfortably in your hands, and is also textured for a better grip – great for that extra grip when your work gloves or hands get a little wet or sweaty. Less slipping means less blisters. Fiskars also has include their version of an overstrike collar. The handle directly below the wedged head is a thicker, durable plastic which functions to protect the main handle from damage. The Fiskar features an 8lbs head that is made of heat-treated forged steel and a rust-resistant coating. The head has more than enough weight to generate the force required to split most logs. It can be a bit heavy for some, which may cause some folks to tire out a bit quicker. The Fiskars is the most affordable of the axes on our list, so if you’re looking for an effective, powerful wedge on a budget, this is a great choice. 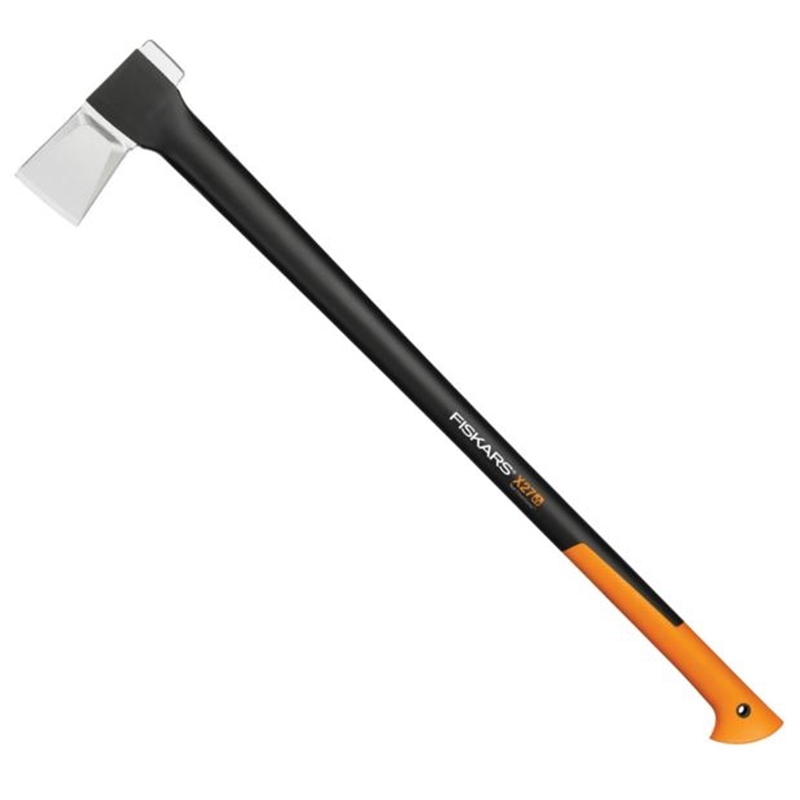 Not surprisingly, Fiskars is on our list twice, this time with the X27 Splitting Axe. 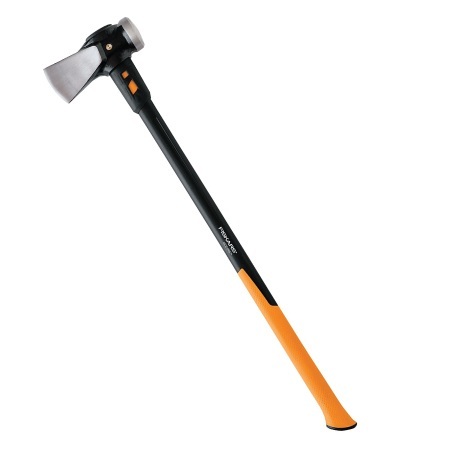 The Fiskars X27 is sort of like a hybrid of an axe and a splitting maul. The head is smaller and more narrow than the IsoCore maul, but it still provides ample torque and weight to split your wood quickly and efficiently. While the edge is said to be razor sharp, it’s not like an axe would be, it still is slightly on the blunt side, making it easier to split wood. The blade is covered with a special coating that reduces friction which allows for easier splitting once you connect. The handle does not have the core technology like the other Fiskars, but is still made with their FiberComp technology which provides so-called “stronger than steel” performance. It also lacks an overstrike collar which would provide extra strength on the shaft right below the head. We have seen these break in that spot, particularly in very cold weather after 2+ season of use. Replacing the handle on a maul isn’t too difficult for wooden ones but can be a little more difficult for these synthetics. But, the lifetime warranty should take care of any similar issues, however. Online reviews are extremely positive as well. The 36″ shaft may be a bit long for some users, but if you’ve got large, wet logs to get through you want that extra torque. Taking the price point into account, you can’t go wrong with this model. The Wilton Splitting Maul is another synthetic handled model that is really making a name for itself in the wood chopping community. Wilton has manufactured this axe with “unbreakable technology”. They’ve actually reinforced the handle with steel rods to eliminate any risk of cracking or breaking like a wooden handle would, even when over striking. Wilton is actually so confident in their unbreakable handle, that they offer a 2-year, $1000 warranty should the handle break from regular use. That’s right, if the handle breaks from regular wear and tear over 2 years, Wilton will give you $1000. They’ve tested the Wilton to 25,000 overstrikes, so you know that this tool can really take a beating. The handle is also covered in a non-slip vulcanized rubber grip, which eliminates any hand slip, which could lead to blisters or more dangerous injuries. Similar to the Fiskars, this Wilton features an insulated shock-reducing handle that absorbs the vibrations that would normally make your hands and arms shake – especially from the steel rods being struck. 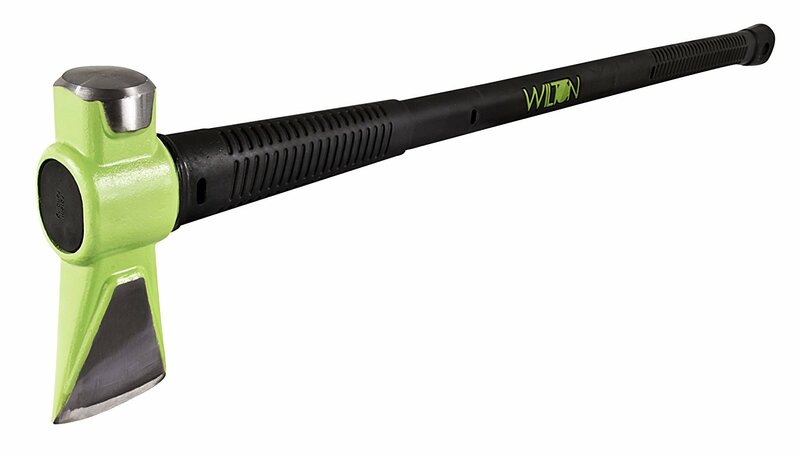 The bright green recognizable hi-visibility wedged head is an 8lbs crusher that will easily handle any log you put it in its way. It’s definitely on the heavier side, due to the 8lbs head and steel handle, but that only makes it easier to split the logs once you get it swinging. The Wilton is an excellent choice for most situations. Still not convinced? Maybe this video will help. We hope this article helped you pick the best model for your needs! Comment below with questions, and let us know which one you ordered!